Tableau dumbbell charts, also known as DNA charts, are an alternative visualization choice for illustrating the change between two data points. Dumbbell charts get their slang name from their appearance, which look similar to weights, and sometimes strands of DNA, when they are in a horizontal orientation. Tableau dumbbell charts are actually dual-axis combination charts, where one of the axes have a mark type of circle and the other has a mark type of line. 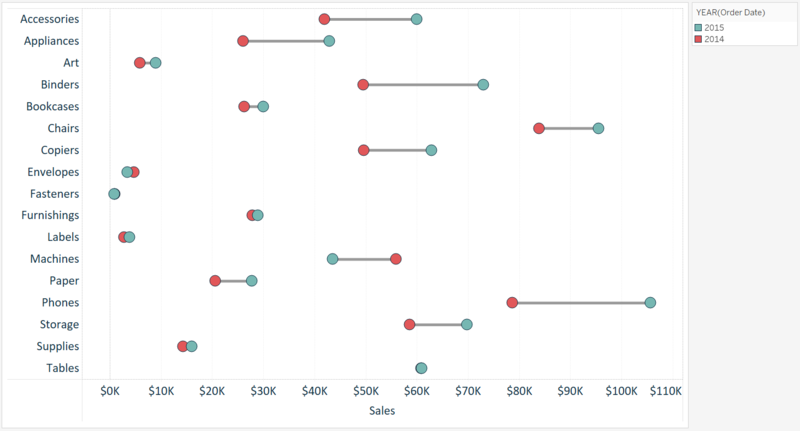 If you are unfamiliar with using two axes in Tableau, it may be helpful to read How to Make a Dual-Axis Combination Chart in Tableau before reading further. 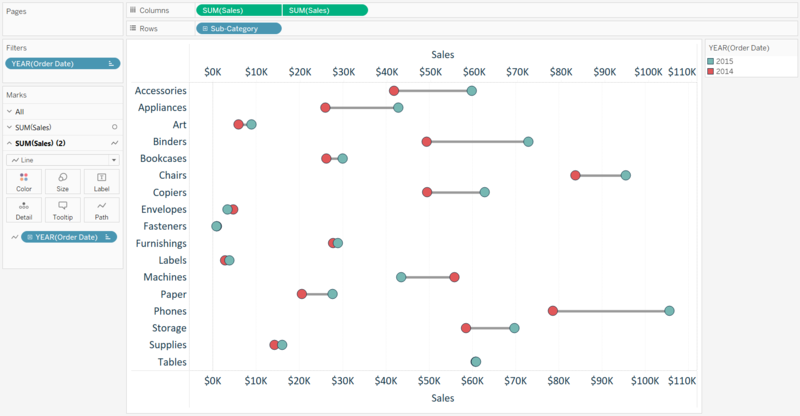 This is a preview of the Two Ways to Make Dumbbell Charts in Tableau video at Playfair Data TV. For this tutorial, we will recreate this visualization which compares the year over year sales per sub-category in the Sample-Superstore dataset. The first step to creating a dumbbell chart in Tableau is to create a dot plot with the measure and dimension you want to visualize. In this example, I will place the Sales measure from the Sample – Superstore dataset onto the Columns Shelf and the Sub-Category dimension onto the Rows Shelf. This creates a sales by sub-category bar chart that can easily be converted to a dot plot by changing the mark type from automatic to circle. The second, and actually final, step is to create a second axis with the Sales measure and change its mark type to line. 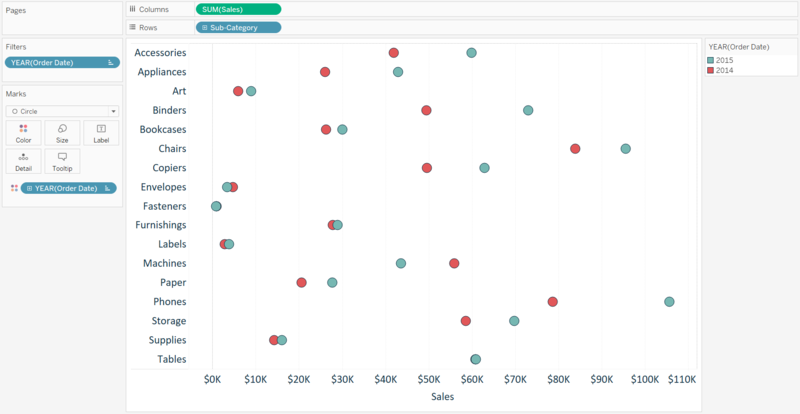 To turn this dot plot into a dual-axis combination chart, drag the Sales measure near the top of the chart, directly across from the sales axis on the bottom of the chart; when a dashed line appears, drop the measure on the view. Alternatively, you can place a second occurrence of the Sales measure onto the Columns Shelf, right-click on the second pill, and choose “Dual Axis”. Ensure the axes always line up by right-clicking on the top axis and choosing “Synchronize Axis”. That’s all it takes to get to a nice looking dumbbell chart in Tableau. From here, you can format the size and color of the marks and hide the top axis by right-clicking on it and deselecting “Show Header”. This content is excerpted from my book Practical Tableau: 100 Tips, Tutorials, and Strategies from a Tableau Zen Master published by O’Reilly Media Inc., 2018, ISBN: 978-1491977316. Get the book at Amazon.